Specifications: Internal dimension 26"X20"X15" (66X50X37cm) Crate dimension 31"X24"X17" (78X61X45cm)　Net weight 15Lb (7kg) Note: The shipping cost is calculated by it's shipping volume, equal to 80Lb. Special NOTE: The screen frame is NOT included in the tank. Small volume and light weight, convenient to move and lay. Versatile entry-level washout tank has wide application. Not only can be used to wash stencil, but also can be used to clean screen and remove emulsion. Splashed water and emulsion tend to bottom which solves the problem that they will spill to surroundings and operator's body. Equipped with automatic water press gun, no need pump to assist. It can joint the tap with 0.6"or0.8"(15mm or 20mm) internal diameter. The nozzle can spray 4 kinds of flows to meet different needs. Premium clapboard fixes screen frames completely, no artificial aids, avoiding dirty water to splash up into the screen during the degreasing process causing dark spots, fish eyes, or pin holes. 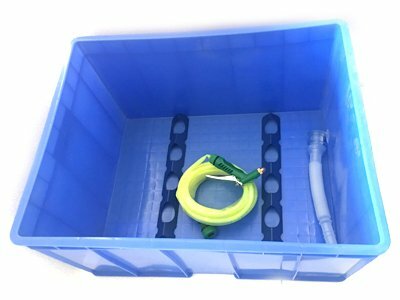 Water tank is made from eco-friendly polypropylene, leaving a hole which leads dirty water to sewer by a equipped plastic down comer.